Since I can find few scientific studies (Please alert me if you do! ), I am left with anecdotal evidence, which is not great. Often, when people report anecdotally, I note that they are also reporting a myriad of other symptoms from diabetes to peripheral nerve pain and I am almost certain that primary Burning Mouth Syndrome is not their major ailment. It’s a complicated picture, but one I hope that some researcher will find fascinating and make a statistically relevant study. I predict my fellow sufferers will try this treatment if it becomes legal and available and although the thought of actually putting something hot and smoky in my already burning mouth makes me recoil from the idea of ever smoking marijuana, I would probably be open to trying the oil or an edible form to see if it helped. There is one study that included Burning Mouth Syndrome and cannabinoid receptors, but it was four years ago, only involved sixteen subjects and concluded that the eight Burning Mouth Syndrome sufferers had “increased TRPV1, decreased CB1 and increased CB2 expression in tongue epithelial cells also associated with a change in their distribution. It would appear that these receptors are related to BMS. These data could be useful for future characterization of BMS epithelial markers and therapy.” This small study could give hope for a diagnosis protocol, but it offered no evidence of symptom relief. You can read the abstract HERE. That is something to discuss with your doctor, my friends. As with any medicine, there may be side effects and you should be as careful with this one as any. Follow instructions, and don’t drive or drink alcohol with it since you may be impaired or at least drowsy. Unknown. 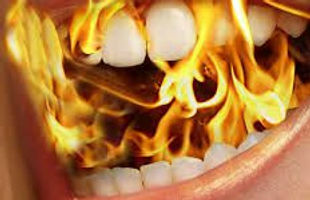 Perhaps some of us will find relief with this treatment, but if my anecdotal reading is picking up anything, it is that few are saying it helped their Burning Mouth Syndrome pain. Want to see what Politifact says about Cannabis Claims? Check out http://bit.ly/2qNG9Yt and see what is being said, and how true the statements are. We will see, but meanwhile, keep your coping strategies going, take any medicines that help and don’t have more side effects than they are worth, and we will all hope for two things in our immediate future…a standardized test for diagnosis, and God willing, a cure. I am glad you have found a combination that is working for you. Experimentation is often the key to finding the right coping strategies and pain-relieving meds. It seems to be highly individual. I have tried CBD Oil without much effect and do not have a legal way here in Texas to purchase anything containing THC in a therapeutic level. Perhaps things will change here, but it may be years or even decades. I believe I have BMS. I have recently discovered that having an edible (marijuana) made things feel worse. It may be in the sub ingredients I use to make it. Maybe the chocolate has something different in it but it definitely hasn’t made my BMSand better. Good luck to you and stay in touch! I am afraid I don’t know what Cvs/thx is. Could you elaborate? I meant to write a ratio of 10:1 of CBD and Thc. I am in hospital now, had hip replacement yesterday, thus my erroneous lettering! Wow, here’s wishing you a quick recovery! Thanks for the clarification.